Whether you are starting out in your DAM implementation, or you have a mature system, making sure your application is as easy as possible to use is one of the most important things to keep your users engaged. Here are 5 tips that you can review to make sure your user experience is in tip-top shape! When your users are trying to find their way around the system, especially for the first time, giving them a simple user experience is paramount to ensuring they spend the time to find what they are looking for. In many cases, it is easier to give users a representative image for each folder/sub-folder, rather than relying on text descriptions. 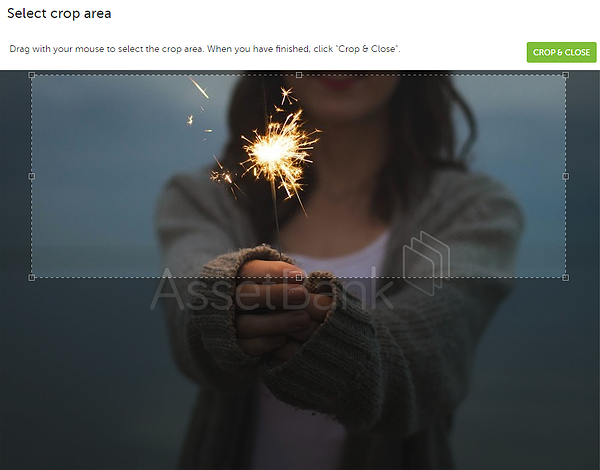 In Asset Bank this concept can be used to improve the user experience of both the homepage and subsequent sub-folders when browsing through the different areas of the application. When you create new folders they will have a placeholder icon displayed on a grey background. This doesn't tell your users anything about what they will find in that folder, so the user has to take time to read each folder title, which can be a little slow and unintuitive if a user isn't sure between different events, for example. Adding images to your folders to give an idea of the content you will find inside is a simple way to make your system more attractive and also easier to navigate. You could use imagery that your organisation owns for this, such as company logos, or carefully selected stock photography can work well too. If you're able to leverage the skills of a designer then it can be really effective to further customise the images you've chosen. In the example below we have added a colour filter and white icon to make it easier for users to identify the content in that folder. You could do the same thing without the background image if you prefer! Often people arrive at a DAM looking for an image to use for a specific purpose - whether it's the upcoming company newsletter or to update a social media application. By configuring your system to allow users to download pre-determined sizes it both saves time for users and helps to ensure consistency across your organisation. By comparison, if your users are only able to download an original file then this can be quite a time-consuming process - the file may be very large, and in some cases, the file may need specialised software to open and edit, which may not be available to the end user. Making sure your taxonomy is configured to suit the needs of your users can make it faster and easier to upload images correctly, but also it can improve the search experience across the system by giving your users more specific options. A simple example is over-use of broad attributes, such as "Description" and "Keywords". If you are able to split these out into different sections of metadata that are key to your organisation (e.g. 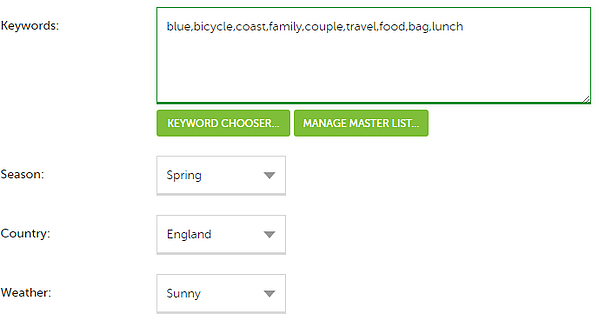 'Season', 'Country', 'Weather' in the case of a travel company) then it means that the information will always be captured, terminology used is more consistent, and users can more easily create a search using drop-down attributes, etc. Using the above example, here is all of this information grouped into a single 'Keywords' attribute along with other, less important, information. This is a simple example of how the page could look once you've created some additional attributes for your key information, rather than grouping them together in a single attribute. This can be especially helpful if these attributes need to be mandatory! The Folder structure that you have set up is one of the key things that influence both the navigation of the system and the permissions that your users have for different assets. The initial design that you installed when the system was set up was likely to be suitable, but as your organisation grows and changes this original structure can often fall into disrepair, making it hard for users to find what they are looking for. A simple example could be an 'Events' folder. Having the latest events that you are working on held at the same level as events from five years ago can be a little misleading and slow down your users from finding the assets they need. Which of these two structures looks easier to navigate when you are looking for material relating to upcoming events? Consider your existing structure, use the reporting tools in the system, and talk to your key users! Which Folders are most commonly accessed, which could be archived, and which areas could be created? Following on from archiving old Folders, it's also important to consider archiving your old assets. There are a variety of different ways of doing this, and you need to consider whether you want to remove them from the view of users/administrators, or simply move them into a different location so it is a specific choice for a user to browse old assets. In Asset Bank there is a default attribute called Active Status, which allows you to tag an image as 'Inactive', 'Active', or 'Expired'. 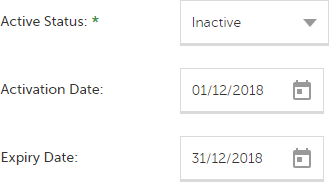 There are also a couple of date-based attributes that allow you to automate changes between these settings 'Activation Date' and 'Expiry Date'. Using these can help to remove these assets from being accessed by your users, and if you want to further make it easier for administrators to identify these files then you could set up Filters - hiding these files by default but allowing the option to display these when it would be useful. 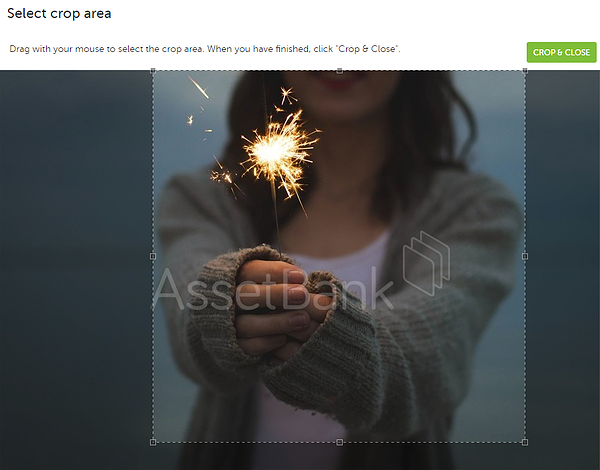 Whether you're interested in Digital Asset Management as a topic or Asset Bank as a product, we're always interested in helping you get the most from your assets - ultimately saving you time and money. Get in touch if any of these suggestions sound like they would improve your user experience and we'll work with you to make sure you're getting the most from your DAM.